Sustainable NE Seattle will host work parties at The Gathering Place at Hunter Tree Farm on Tuesday evening June 7 and Saturday morning, June 11, and a Backyard Barter event on Sunday afternoon, June 12. On Saturday, June 4, Sustainable NE Seattle began the every-summer clean-up at the Hunter Tree Farm to prepare the site for event use. Work was begun on trimming the grass and pulling weeds at the site, plus repairing and repainting the movable benches. 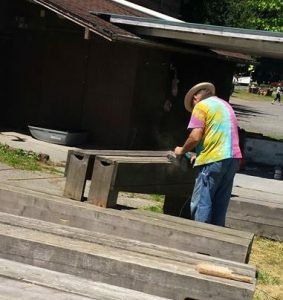 If you couldn’t make it last Saturday, please do consider joining in on Tuesday evening, June 7 or Saturday morning, June 11, for more sanding and painting work. Get to know these outstanding community volunteers and have fun working together. On Sunday, June 12 from 1 to 3 PM Sustainable NE Seattle will host a Backyard Barter at the Hunter’s site, 7744 35th Ave NE. Any homemade or homegrown items may be brought for exchange with other people. Are your zucchini plants taking over your garden? Bring some and exchange them for…a tomato start? a loaf of bread? This is not a rummage sale but is only for items you have grown or made, and good deals will be available! 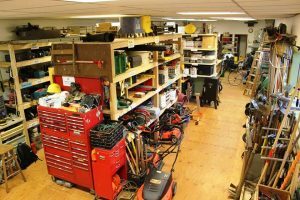 In other Sustainability news, new coordinators are in place at the NE Seattle Tool Library at 2415 NE 80th Street. Mike is a long-time volunteer with a background in home construction and landscaping, tasks for which tools are often borrowed from the Tool Library. Chris is a Wedgwood resident with an art studio in his home and he is known for his work with metal, including garden art pieces. Both guys will be greeting you with a friendly smile and will be able to help you select the tools you need for your home project. If you have not yet joined the Tool Library, now is the time! You may sign up to borrow those items which you might only use occasionally, instead of purchasing items which will clutter up your garage during the rest of the year.